Irene Loves Elephants: May 13th Friday The Thirteenth! Did you know that a fear of Friday the 13th is called 'friggatriskaidekaphobia'. I am a veritable goldmine of information aren't I? Not that I myself suffer from friggertrickadelphia (easier way to remember it). Nothing bad befell me on this day. Well apart from one small spot of bad luck. I was sampling a new brand of porridge for my breakfast, which coincidentally I don't like the taste of. Neither the taste or texture was to my liking. 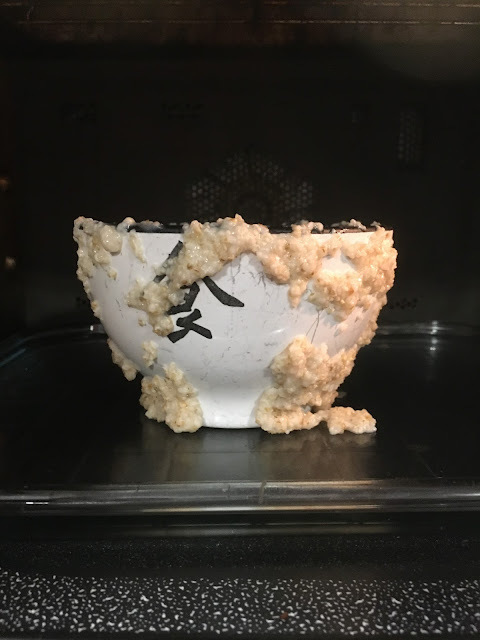 Also this is a microwaveable porridge and I followed instructions to the T, next minute look what happened!